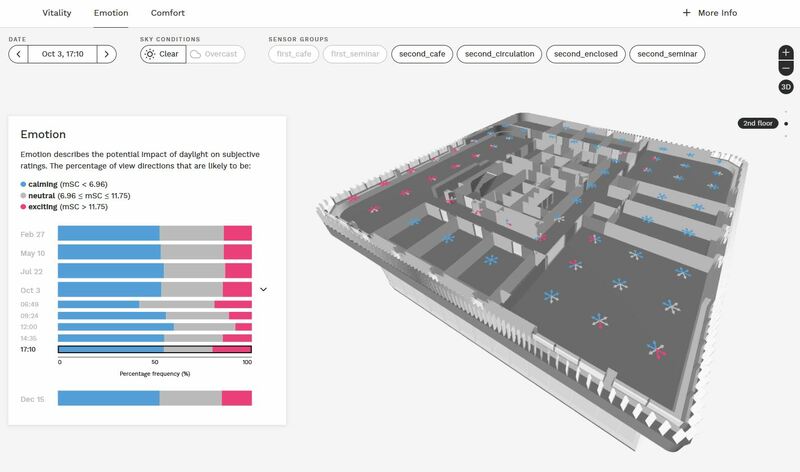 Using the funds allocated from EPFL’s InnoSeed grant, the Oculight team has hired Interactive Things in Zurich to help develop the web-based visualizer for our simulation workflow. With a seamless representation of spatial and temporal data, we’re working on an online application to view daylight performance results. Using metrics designed to predict vitality (nvRD), emotion (mSC), and comfort (DGP) from an occupant-centric perspective. We’ve entered a market research phase with a select group of architects, after which we will share the results and expand our collaborations to the broader industry. Stay tuned! Next How healthy is the daylight in Poli House?